After the climb of Fuji on 17th. 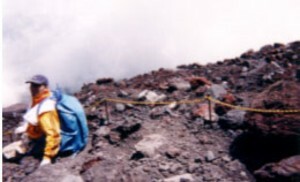 July 2000 there were three years of deep meditation to immortalize the sensation I had during: the preparation, the climb, the moment at the peak, and the descent together with many people of different nations, descending but at the same time absorbing their experience of the Spirit found on Fuji. Now is the moment to explain why hundreds of thousands of tourists visit Fuji every year, and at the same time I want to express my great love for Japan and Fuji. The next step is to understand the new way of living in Japan and those who face Fuji with a balanced Spirit. 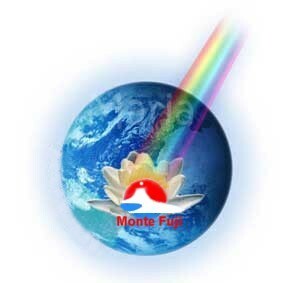 Who absorbs the first truth can have the knowledge that Japan and Fuji are really the country and mountain divine. There is no doubt Mikado, who says Japan has Volcanoes. There are 192 of which 58 are still active and are distributed in a chain from north to south of all the country, giving source to thermal waters and they follow the direction of the solar arc. The highest and most famous volcano in the world is a little north of the splendid Baia di Suraga, and it’s name is we all know, Fuji, or Fuji-San or Fuji-yama. It is a volcano with a perfect circumference at the base of 41 kilometers. 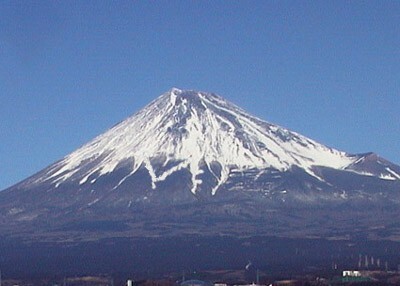 Fuji has an elegant form with two soft curves rising to the peak. Above 2,700 meters there is no vegetation and the scarcity of water makes the mount even at the base Spartan of green. In the winter Fuji is covered in snow but the top remains always white except for a short period at the end of July for about a month when the rains come. The summer in Japan is hot and damp. I remember that in the vestments of Kami you told me that Fuji rose from the plain in one night in the year 177 b.c. but the official date is 286 b.c.. scientists and geologists affirm that it is much older than 286 b.c. “I remember all my dear Mikado, and now I shall take you into the 7 laws. Our measure was 3777 in height, circunference 607 mtrs. * and Fuji has 10 bases to rest and in my opinion number 7 is the most important and is at 2700 metres. *The official measures were made 10 years ago and are 3776 in height and 610 metres in circunference. “Fuji, that means “sacred Fire” has had about 17 eruptions of ash and lava since 777 a.d. and a volcanic cone that erupted in perfect symmetry was in 1707, covering the roads in ash up to 100 kilms. Bringing terror to Japan. ”I remember Mikado and I remember thanks to the smoothness of the walls it is not possible to hurt yourself. You told me that the Fujiama is a cone form and the crater is perfectly formed like a bell of stone. You and Yuzu Asaf told me the legend. Mikado Nintoku interrupted: “Wait Francesco, I think it is important that you tell us who the Yamabuschi are” - “You are right Mikado. On Fuji lived and live to this day the Yamabuschi who practise initiations with the use of symbols and songs called “shu” that give the supernatural power known as “Gen” that accompanies the person in the “path that leads to the divinity” known as “Do” or “Va”. All this is kept inside me in the three lives as Kami, Usui, and Francesco, with the name of Project Mikado Nintoku. The Yambuschiare conserve all the ancient Spirit of Japan and are able to satisfy any desire relative to the present life, we can spread at will, the force of nature, we have the consciousness of the bad and the dark, and we can fight and rise with “fasting” “prayer” and in a superior Mudras. This process is the last state of the Project Mikado Nintoku. Mikado interrupts and says: “Francesco I say you are a Spiritual Sensei and like you, all those that conquer themselves with the aim to remind man of the path indicated by Yuzu Asaf. The ancient Japanese people had a sacred admiration, respect and fear. From these sentiments is born scintoismo, for some a pure choice of life, in which every force of nature “felt by man becomes a divine, a kami, and is with the God Amaterasu with his rays of sun is the origin of all the Kami and of the Japanese themselves. Mikado Nintoku-tennò tells me that Fuji was the great protector, the guardian of the immortal destiny of Japan immortalized on a Japan play:“Kami do you know that many Japanese do not know the spiritual meaning of the sacred play. Today I will tell you and tomorrow you will tell the world around you. The warm rays sent by the God Amaterasu are represented in the sun and Fuji by the red fire inside the sun, while around represents purity of the ancient Spirit that the Japanese people with incredible perseverance, keeping their sense of family unity, go ahead in time, arriving until the peak, becoming one of the richiest and most modern countries in the world. This success has been paid for dearly though, because they have lost their balance and strength that for thousands of years has been the source of their art, literature, and spiritual path, and finally their identity. The contact with nature and the Divinity. Caressed by waves of pure energy. “Yes, Kami is a God but also a legend, a myth, a dream, a hope and a nightmare, because the word Kami means all this. 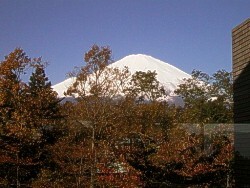 As the spiritual behaviour of the Japanese is towards Fuji. Yes, 7 is the number that God chose to create the world. Take the knowledge that God gave to Adam and Eve of good and bad, in that moment the 7 original sins were born. These are residing in the 7 principal Chakra. Mount fuji from October to May, it is more or less covered in snow, and in winter it is one of the most beautiful natural sights to be seen. It is beautiful also seen from inside the country seen from the heights of the Japanese Alps. At the foot of the mountain there are five lakes, four of which are medium size and one smaller but fascinating in it’s remoteness, these are formed on a plane of a thousand meters in altitude and form the base of the volcano. Mount fuji or fujisan, as is called is Japanese, the san means mount and not as some still believe “Mr Fuji”; is surrounded by five spectacular lakes. The Yamanaka is at 900 metres and one of it’s beauties is the cherry blossum in May. The most beautiful is Kawaguci, where in the centre is the Island Unoshima, with a sanctuary dedicated to beauty. Less know is Motusu, the deepest, Shaj with it’s splendid panorama, and Saiko surrounded by woods and it’s water rich with fish. 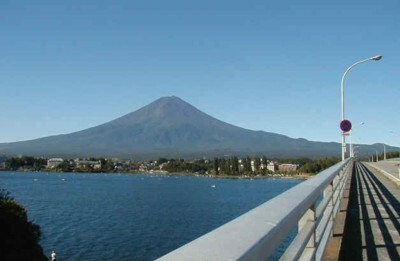 These five lakes render fuji ever more beautiful and are popular with the people of Tokyo for picinics. There are acquatic sports, and grottes to see. It is about 300 kilometers from the sea. A wonderful panorama of the sea can therefore be seen from it’s height. All the zone around Fuji is covered in hot springs. 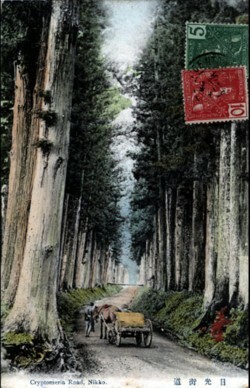 On the north east side of the mountain there is a large forest called Jukai, “the sea of trees”. These natural beauties have made Fuji a complete divinity and symbol of Japan, just as the Eiffel Tower or the Statue of Liberty, the pyramids, and the Tower of Pisa are all symbols of their countries. The quickest way to reach the area of Fuji is to take a bus from Shinjuku, which takes you through a network of lakes and planes of the Mount Fuji. When you look at Fuji with the spirit of the modern Japanese, I think you can say that modern Japan is an immense problem called Fuji itself, because it is not exactly how the spirit of the right Japanese should feel. “But the Fuji of my father, grandfather and all my descendents is nothing more than a mountain? Isn’t it the symbol of Japan itself? Is it not an intimate part of the Japanese soul? 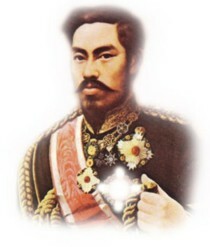 Is it not with the Emperor the root of identity of Japan? Is it not the reason why we Japanese are proud to be Japanese”. Believe me is the past it was so, and I hear the past of my first period in the vestments of Sensei Kami together with my dear Mikado Nintoku -tennò and their as Mikado Usui until I arrived in the new vestments of Mikado Francesco and ask the last question. “Where are you my dear Japanese? * I am the messager of eleven Divinities of Fuji. 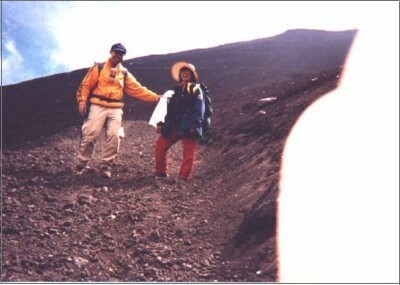 Climbing Fuji with other components of the divine “Projet 70” I realized the terrible loss of the Japanese. Fuji is no longer an altar of “Sun and Stars” or a great force of nature, but a reproduction that each one has left unknowingly behind, today you live the sacred climb on Fuji with the spirit of a simple modern climb, or as they say in english “modern living” it isn’t like in my ancient past of Kami or the period of Mikado Nintoku-tennò or Usui, where before beginning the climb you knelt in prayer to be helped in the divine path. Now it is alive is my memory the deep teaching received in my first moments of growth with Mikado Nintoku-tennò regarding Fuji: “My dear Kami, know how to absorb the deep significance of the mountain given to me by Yuzu Asaf they are the great cathedrals of the earth, the great doors of rock, mosaics of clouds, streams,and alters of snow, brillant with Light and Stars there you kneel in front of the Unique Father. You must know an ancient tradition that originates at the beginning of time, that always identified the peak as the “seat of tradiction” when you climb Fuji, or any mountain, stop at the beginning in full consciousness and when you arrive a metre from the peak have a deep respect torwards the house of the Unique Father. 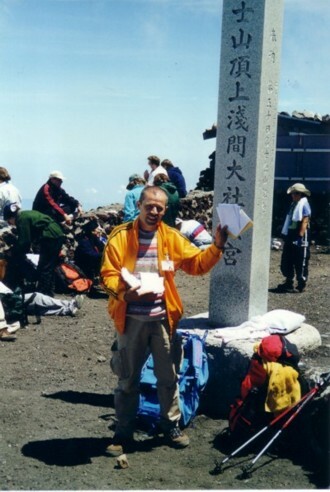 And in this spirit at three o’clock in the morning of seventeen July 2000 I head for the peak of the sacred mountain of Fuji, thinking how for centuries Fuji has been the place of the Gods of Kami for the Japanese. The beautiful and not beautiful, the anti-camera of light or Kury-ana and the light of Fuji, the Reiki Kury-ana or the Project Mikado Nintoku, the seat of Mikao Usui or Mikado Usui. For the ancient Japanese, Fuji has been the mirror of the special relationship they have always had with Mother Nature, planning generation after generation that a person in the family can exit Kury-ana and follow the path forwards the peak to purify the family until the 7th generation. It is important to understand that this “Carde Idim” or familiar karmic purification is enough to live only once and it is useless to repeat the spiritual process. I remember when I expressed to desire to repeat the spiritual climb on Fuji, he looked at me and said: “Kami, to climb Fuji with the Spirit once is wise, but twice is stupid”. “You know that certain courageous choices give a unique mysterious irrepetable experience, and naturally this is valid for the fasting of the Spirit”. On very clear days it is possible to see Mount Fuji from Tokyo, but most of the year it is necessary to go as near as seventy kilometres from it’s rim or Kury-ana to be able to see it well as it is always covered is mist. It is the most beautiful in winter when it is capped in white snow. Officially the seasons to climb are July and August and the Japanese visit in numerous groups during this period. It is possible to climb the mount any time of the year but in winter it is better to have had some Alpine climbing experience. My humble advice is to not take the climb lightly, remember just the high altitude can cause many problems. The view from Fuji is the best early in the morning not only to admire the beautiful sunrise but at that time it is not surrounded by clouds. My other advice is to start the climb at three, five or seven o’clock in the morning. Choose your moment of “carpe diem” between 1st. July and 31st. August, that represents the official opening of the Fuji climb. You start and continue for 33 kilometres and pass the 2nd. 3rd. and 4th. Station. Then you arrive at the 5th. Station at 2305 metres in height, here you leave the car and begin the spiritual walk finding the second purification that of body, emotion, and Spirit. In the good season thousands of pilgrims climb in file and it is a wonderful sight particularly at night when they all carry a burning torch. It is important to follow the paths and to wear heavy clothes and gloves that can protect the hands from the rock of lava. Leaving the ledge or Kury-ama you begin the climb and at 2390 metres there is the 6th. Station and continuing until 2700 metres you find the special 7th. Station. Of purification of karma, where the first aid post is open only from 19th. July until the 22nd. Of August. Arriving at 3700 metres you find the third and last door that completely frees the Spiritual body. Between the 6th. And 10th. Station you meet sacred temples representing thousands of Divinities of which Fuji is one. At the top there is the great pillar of peace and a sanctuary dedicated to Konohana Sakuya, the Princess of the cherry blossom and the 8th. Divinity of Fuji. On the crest of the crater there is a big mound of stones brought by the pilgrims that represent the personal karma or the family that the Divinity that reside on Fuji must purify. According to an ancient legend the spirits of the dead children have the task to fill the river with the stones that the pilgrims that arrive to the top bring with them. It is important that this spiritual climb is completed within a divine cycle of 7 hours. For the descent it may be between three and seven hours of complete freedom of the spirit. The origin of the name is much discussed by Japanese scholars, I, Mikado Francesco declare that the real spiritual meaning of the name Fuji-san was transmitted in the year 107 a.d. by the greatest Emperor in Japanese history Mikado Nintoku-tennò, who is second only to the Father Yuzu Asaf, or rather Jesus!. Mikado Nintoku, taught me to admire the mount as a Divinity. He was the first emperor to consider the volcano sacred, and the immortal seat of the Divinities. Through the love of Mikado other sovereigns have learnt to love it and to make there nation aware of it’s divine beauty. Fuji is one of the ancient paths of salvation for the Japanese people and a great part of the western world that make up part of the hundred million people who visit in admiration every year this incredible mount. Mount Fuji can be reached through a new rapport with nature that brings the person to an age of innocence and with the hope to be saved from the internal and external holocaust. According to the spiritual path of Scinto the mount Fuji is the most important point in Japan. Apart from being the seat of all the Divinities of Japan, and also has a particular tie to Fuji, it is a very popular God, Kono hana-sakuya-hime, “the princess that makes the trees blossom” and particularly the cherry tree. The practice of climbing the king of mountains or Fujisan began as a religious rite in the time of Mikado Nuntoku-tennò (85-399) when I lived in the vestments of the peasant Kami and then fell in a deep sleep. Today the climb is often a simple excursion to admire the beauty of the nature. But also many religious groups have started to venerate Fuji creating around 1,300 temples. After the passage of death of Mikado Nintoku-tennò the world of love and peace that he created fell in a deep sleep and a long period of egoism started in the land of The Rising Sun. A life of hate and a lack of any of the moral principles that were taught by Mikado, proceeded. In that dark period Fuji showed all her fury and refused all the women that tried to climb to the peak, stopping them at the ledge or Kury-ama, and there they were wounded in some way or even died. At about 2700 meters high there is a chapel called Nyonin-do. This means the “shelter for women”. This is the place where the women can wait in safety for their men., the adventurous men that went to the peak to obtain family karmic purification. Many religious groups in the period of peace and love of Nintoku often dressed in white and went further than the kury-ama without the women with the aim to arrive at the top to communicate with the Divinities of Fuji, they asked the great sensei why the sacred mountain refused the women. The only answer they gave in answer to the behavior of Fuji, was that women were seen as responsible for the principal cause of the life without principles and put in the world selfishness and other negative sentiments. Women were forbidden until 1868 that thanks to the immortal spirit of Mikado Nintoku-tennò incarnated in the vestments of Mikado Meiji-tennò, the young new emperor of The Rising Sun. That the ban was lifted is well known in the third millennium, and the last Mikado to dress as governor of Japan in the vestments of a woman and composed of lights and stars. After the passing through death of Mikado Mejij-tennò the world of peace and love created by him fell in a deep sleep and a long period of egoism fell on the land of The Rising Sun. Hate and life without principles that were taught by Mikados brought Japan to the point of knowing the consequence of the atom bomb. 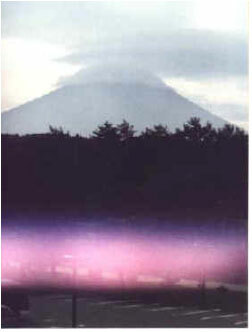 The access to Fuji opens with various rituals at the beginning of July and closes on the 26th. August with a great ceremony at the sanctuary of Yashida at the foot of the north east mount. In the summer months they say that more than 100,000 people climb to the ridge of the Fuji where there is the chapel of Scinto, and other sanctuaries around the mount. At the top there is a modern observatory open all the year round. Now the climb out of season has become very popular, but in the winter with the snow and ice it entails a climb of expert mountain climbers. It also requires very special skills and equipment. In spite of this every year many deaths are recorded due to falls or avalanches. Even today there are associations dedicated to the cult of Fuji and the ascent of this mountain, they are known by the name of Fuji-ko. At the foot of the mountain there are many stones left to commemorate those who climbed the mountain 100 times or at least 66 or 33 times. Today the climb is facilitated by transport that takes climbers to 2305 metres (5th. Station) to a plateau where from there still remains 1,000 meters to climb. The young can come down almost flying on the sandy surface of fine ash that covers the mountain. The view from the ledge if there isn’t any mist is marvelous at any time of the day, but the most spectacular is at sunrise, that is the moment that creates the most intense religious or mysterious emotion. My dear Mikado, in this world there are only two volcanoes that have the power to influence life and they are Etna* and Fuji. The immortal love for Fuji that I feel in every cell, I have tried to express in this book, but it is also important that I speak of the love and respect I have for the volcano that saw me born and awoke in my spirit the love I have for Fuji and Japan. This happened at the age of five in the company of my father. 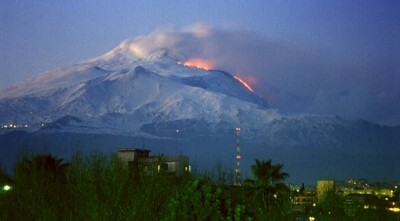 Etna was formed about 700.000 years ago it started with an eruption under the sea in the golf of Catania. It is 3350 metres high and one of the highest in the world and certainly the highest in Europe. It has the shape of a cone about 40 kilometres in diameter and 40 in circumference. 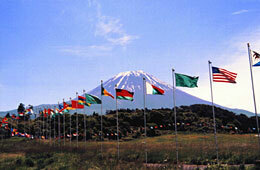 There is no other volcano in the world apart from Fuji that has had so much influence on the world and it’s customs. If you look from a distance , the mass of Etna looks like Fuji, that is, it is a regular cone with the difference of the perfection of fuji, it has three beautiful craters on its summit. There is no doubt that when both are covered in snow at the peak, the dense green woods at the base of Fuji, and the orchards at the foot of Etna, it can be said they are both so beautiful to seem unreal. * Called Aetna by the Romans “Mongibello” this term comes from Italian Monte and in Arabic Gebel, that also means mount. On Etna there are hundreds of minor cones that emit gas and smoke; the central crater with its edge bordered by crystalized sulphur and it is wrapped with smoke almost always and in the other three craters are minor explosions. It is written in my Divine Book that Etna in time will become more violent and will loose its sweet characteristic. Would you like to know when? When the huge road of fire under water road looses control and then, what happened in Pompei because of Vesuvius will only be a third of what will happen in the same moment to Fuji and Etna. A climb up to the peak of Fuji and Etna is something that everyone should experience both for the incredible sight of the live volcano and for the beautiful view from both mounts. The land around Etna is more densely populated than in all the other land in Sicily. Apart from my town of birth Catania, there are also cities such as: Acireale, Giarre, Randazzo, Adrano, and about 63 other small towns. In May of 1981 the Sicilian region pushed by a group of environmentalists passed a law of protection of the lands around Etna that in all covered an area of 150,000 hectares of which 12,000 are forests. “ Che La Pace Regni Sulla Terra…”; English: “May Peace Prevail On Earth…”; Japanese: “Sekaijinrui-ga Heiwa-de Arimasuyoni…”; Spagnolo: “Que La Paz Prevalezca En La Terra…”; Tedesco: “Mőge Friede Sein auf Erden…”; Dutch: “Moge vrede heersen op aarde…” and in French: “Puisse La Paix Regner Dans Le Monde…”…. Tens of millions of years ago, when the archipelago of Japan was separated from the continent, Fossa Magna was formed. After that, Mikasa Sanchi was formed. Hundreds of thousands of years ago, Komitake is formed by volcanic eruption. Tens of thousands of years ago, Kofuji volcano repeated eruption, coverring Komitake volcano. 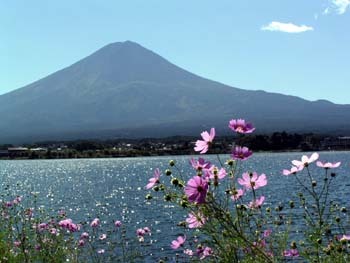 Ten and few thousands of years ago, Shinfuji volcano was active for along time,untill the recent form Mt.Fuji appeared. Since recorded histry, ten and few times of eruption was repeated to create form of Mt.fuji now. 1. From Chuo expressway Kawaguchiko interchange, take Fuji-Subaru Line to Gogome (harfway point). 2. From Tomei expressway Gotenba interchange, take Fuji-Skyline to ShinGogome. 3. From Tomei expressway Fuji interchange, use Nishi Fuji road, then take Fuji-Skyline to Shin Gogome. July 1st to August 31th. The weather is stable, and there is no snow at the mountaintop. 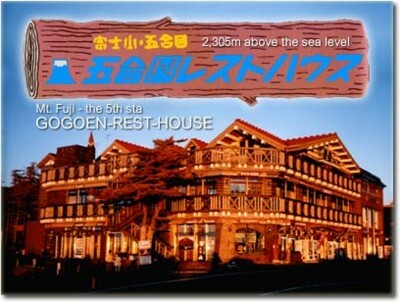 Many mountain huts are open,so most Japanese climb in this season. However, depending on the year, the mountain trail may be partly closed in early July,because of snow near the summit. The weather is especially stable, so a crowd of climbers appear every year. However, there may be a regulation on cars in mid August. Restrictions may be seen in some roads. In that case, use a near by parking area and take a shuttle bus. There may be snow at the mountain top. The weather is too unstable for climbing, and the mountain huts are mostly closed. Equipments for winter climbing is necessary. Also, a planned script for climbing must be submitted. June is rainy season, and in September, taifoon may arrive. You wait don't close the page, I stayed forget me of give you the big gift.